Histone H3K9me1 Antibody, SNAP-ChIP Certified Description: This antibody meets EpiCypher’s “SNAP-ChIP® Certified” criteria for specificity and efficient target enrichment in a ChIP experiment (<20% cross-reactivity across the panel, >5% recovery of target input). Histone H3 is one of the four proteins that are present in the nucleosome, the basic repeating subunit of chromatin, consisting of 147 base pairs of DNA wrapped around an octamer of core histone proteins (H2A, H2B, H3 and H4). This antibody reacts to H3K9me1 and no cross reactivity with H3K9me2 or H3K9me3, or other lysine methylations in the EpiCypher SNAP-ChIP K-MetStat panel, is detected. Histone H3K9me1 Antibody, SNAP-ChIP Certified Certified Immunogen: A synthetic peptide corresponding to histone H3 monomethylated at lysine 9. Histone H3K9me1 Antibody, SNAP-ChIP Certified Certified Formulation: Protein A affinity-purified antibody (1 mg/mL) in PBS, with 0.09% sodium azide, 1% BSA, and 50% glycerol. Histone H3K9me1 Antibody, SNAP-ChIP Certified Certified Storage and Stability: Stable for 1 years at -20°C from date of receipt. SNAP-ChIP qPCR Data: Histone H3K9me1 antibody (3 μg) was tested in a native ChIP experiment using chromatin from K-562 cells(~1x106 cells) with the SNAP-ChIP K-MetStat Panel (EpiCypher Catalog No. 19-1001). spiked-in prior to micrococcal nuclease digestion. Specificity (left Y-axis) was determined by qPCR for the DNA barcodes corresponding to modified nucleosomes in the SNAP-ChIP panel (x-axis). Black bar represents antibody efficiency (right y-axis; log scale) and indicates percentage of the target immunoprecipitated relative to input. Error bars represent mean ± SEM in replicate ChIP experiments. 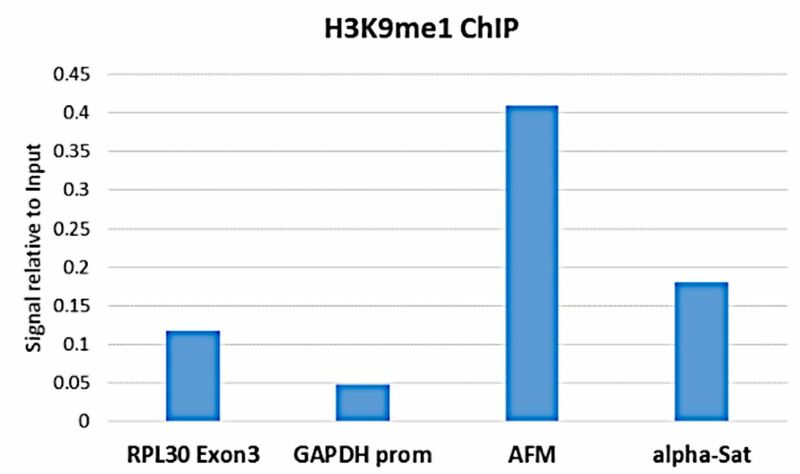 SNAP-ChIP-seq Data: Histone H3K9me1 antibody (5 μg) was tested in a native ChIP experiment using chromatin from K-562 cells~1x106 cells) with the SNAP-ChIP K-MetStat Panel (~1x106 cells) with the SNAP-ChIP K-MetStat Panel (EpiCypher Catalog No. 19-1001) spiked-in prior to micrococcal nuclease digestion. Ten nanograms ChIP DNA was subjected to library preparation using the NEBNext® UltraTM II DNA Library Prep Kit for Illumina®. ChIP libraries were analyzed by 2x150bp paired end sequencing on an Illumina HiSeq 4000. Paired reads were aligned to the SNAP-ChIP barcodes using the alignment algorithm available at https://www.basepairtech.com/. Specificity was determined by normalizing the read counts for each barcoded nucleosome IP to the corresponding Input and expressing the data as a percent of the nucleosome containing the target PTM (% Target). Error bars represent mean ± SEM for the duplicate DNA barcodes in a single ChIP experiment. 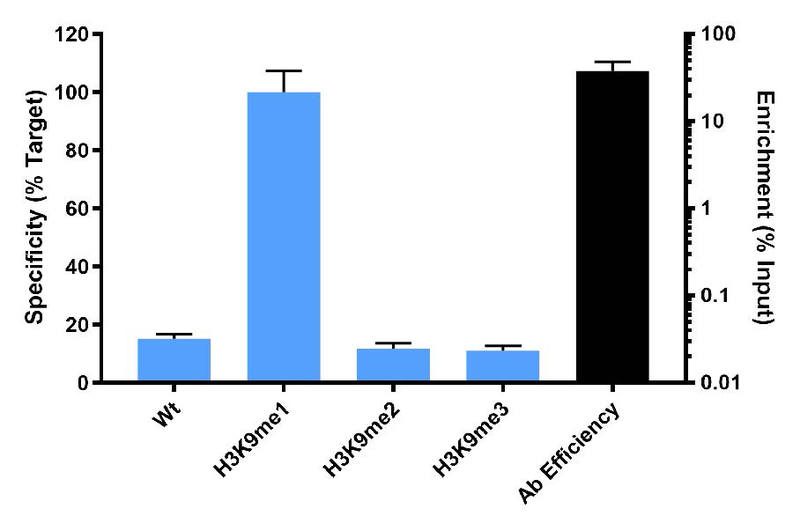 Western Blot Data: Recombinant histone H3.3 (Lane 1) and acid extracts of HeLa cells (Lane 2) were blotted onto PVDF and probed with 0.5 μg/mL Histone H3K9me1 Antibody. 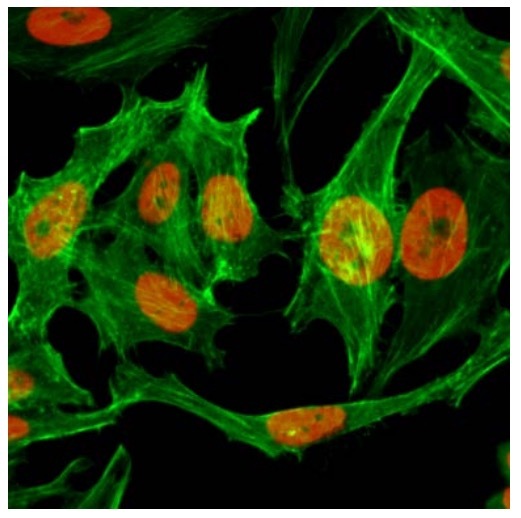 Immunocytochemistry: ICC of HeLa cells, using Histone H3K9me1 Antibody (red). Actin filaments have been labeled with fluorescein phalloidin (green). 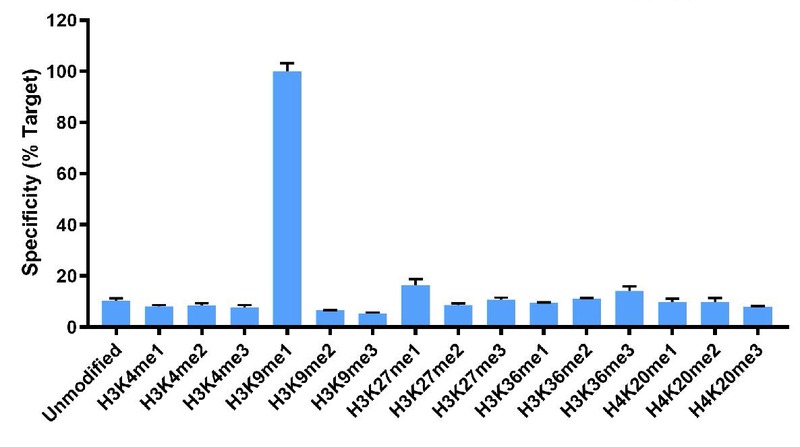 Chromatin Immunoprecipitation: ChIP performed on HeLa cells using H3K9me1 antibody (5μg). Real-time PCR was performed using primers specfic to the gene indicated.